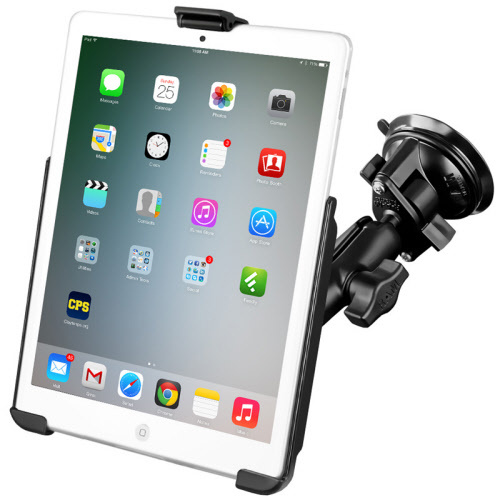 Consists of a 3.3" diameter suction cup twist lock base, double socket arm, round base adapter and EZ-Roll’r™ model specific cradle for the Apple iPad mini 4. The suction cup base is designed to have a strong hold on glass and non-porous plastic surfaces, including RAM adhesive disks. The mount is designed with a RAM 1" diameter patented rubber ball and socket system that has adjustment points at both ends of the double socket arm; this allowing for almost infinite adjustment and perfect viewing angles. The patent pending roller design allows for smooth placement and removal of the iPad, while keeping it secure while on the go.